This article appeared first in the island-themed issue of An Antidote to Indifference. You can find out more about the magazine and order a copy here. I had wanted to visit that small isle off the Cuillin-shadowed coast ever since reading Gavin Maxwell’s book Harpoon at a Venture, published eight years before his classic Ring of Bright Water. Maxwell owned the isle for a few years in the mid-1940s, using its natural harbour as the headquarters for a basking shark fishing enterprise that was doomed to failure. The previous winter I had driven over the bridge to Skye and taken the impossibly steep road down through the village of Elgol to the slipway, where I’d parked up and sat in the car looking across Loch Scavaig to Soay. Ragged off-white clouds scudded across a pale blue sky in which gulls were dancing and staggering about like drunks. The car shook and rocked. Gannets circled and dived into the frothing tossing sea, reminding me of Stuka dive-bombers zeroing in on targets in those World War II movies I watched as a boy. Spray torn from the crests of tightly-packed green waves drenched rock, road, windscreen. I forced the door open, lurched out into the wind and the hat I’d put on my head spun high up a hill out of reach. The wind tore at me, knocked me about, tugged at my coat and blew my shirt tails up over my head. I bent into it, tucked my shirt in and battled my way to the lee of the slipway wall. Waves came smashing shoreward and spume—froth and foam like sheep’s fleece—came piling up the slip towards me. I squatted low beside stacks of creels, coils of rope and floats and through blown-about eyelids looked out to sea to Soay. Amidst the spray and the spume, the darting gulls and gannets, I could make out houses dotted along a road above a bay, as unreachable as the moon. The following year I tried again. One finely-lit August day, my friend Sandy and I hoicked a couple of borrowed kayaks onto the roof of his van and drove over the hills to Glenbrittle. We paddled for what seemed like hours. We struck out for a distant headland, rounded it and paddled along under dripping fern-covered cliffs until we spotted the entrance to Soay harbour a couple of miles away across open sea. We rested, drank, and refreshed, paddled on. The sea away from the coast was flat, cornflower blue, profound and sparkling; it blinded me with reflected sunlight. Kayaking in the main requires only brute force; arms and upper body propel the kayak forward. We powered on. The bar at the entrance to Soay harbour had been a contributing factor to the failure of Maxwell’s shark fishing venture. His boats had to wait for the tide to be right before they could cross the bar and deliver the carcasses to the factory or set out to hunt. Business held up by nature. Sandy and I reached the bar just before low water and our kayaks grounded. The harbour was emptying out over the shells and sand. I followed Sandy as he shuffled and levered his way up and over the bar into deeper water. Above us a ram, motionless on an outcrop of rock in the sun, watched us pass below. A small yacht flying a Dutch flag was anchored in the sheltered expanse of the harbour and as we paddled past, two blubbery women in swimsuits sitting in the cockpit drinking from cans of beer waved, lazily and disinterestedly. There was a square stone building with half its roof missing and a collection of entirely roofless post-World War II prefabs on the rocks. We beached the kayaks in a dried-out cove and clambered over rocks to the buildings—Maxwell’s processing plant. What looked like the front end of a steam train, all inch-thick curved slabs of cast iron, rivets and rust—decades of rust—stood near massive galvanised tanks. Most of the prefabs were empty, their concrete floors cracked and decaying. One of them was stuffed with partially-deflated, mouldering fishing buoys, broken lobster pots, misshapen creels, scarred and scuffed plastic fish boxes, empty pots of paint and tools made useless by rust—a jumble of forgotten belongingsleft out for too long in the rain. On the opposite shore the remains of a wooden work-boat lay in the mud, its hull splayed open like a fly-blown carcass in the veldt. The whole site was a graveyard. ‘Some of this stuff could be useful,’ Sandy said, ‘I may have to borrow a RIB and come back for a proper root around.’ For Sandy this place spelled opportunity, more stuff to hoard away ‘just in case’, for in the Highlands everything and anything could prove useful one day. But for me the sense of abandonment, of the end of dreams, was all-pervasive and total and depressing. I’d seen photographs of the factory site in books and magazine articles—men at work with long-handled flensing knives slicing up basking sharks, the heads of these mammoth fish being craned over the rocks to be dumped into the harbour; the area behind the buildings resembling a boneyard, strewn with discarded shark vertebrae. Not particularly pleasant photos to look at, true enough, but they were full of visceral life and death, of vitality. Now there was just an end of days feeling about the place. We sat on a patch of grass in the sun and ate sandwiches, the silence broken occasionally by a peal of girlish laughter from the Dutch yacht, by the trilling of an oystercatcher as it shot across the still green water below us. We hacked our way through brambles and head-high bracken to the other side of the island to take a look at the houses along the bay. There was no movement there. The few houses that weren’t derelict were empty of signs of life or love—faded window frames and peeling wallpaper, closed doors and shuttered windows, dark interiors and silence. Sandy was less loquacious than usual that day on Soay. ‘Sad,’ was all he said about the abandoned village, and he didn’t go poking about the remains. Harpoon at a Venture was published in 1952 and has been in print pretty much ever since. (It was reprinted by Birlinn in 2013.) 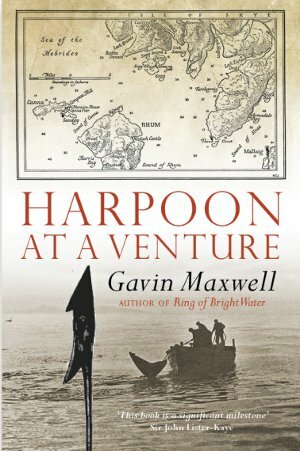 It was Maxwell’s first book and recounts the story of the Island of Soay Shark Fisheries Ltd., a short story involving big fish and out-of-control expenditure. He had bought boats and took on his fellow ex-SOE instructor Tex Geddes and others as crew. He offered the Soay islanders nasally-challenging employment cutting up the sharks and rendering down the livers to extract the precious oil used in the production of cosmetics, margarine, lubricants, fuel, and much else. Shark fishing, and especially the processing, was an altogether vile business and not something the Soay islanders were overly keen to help with. Maxwell poured money (his own and other peoples’) into the venture, but by the spring of 1948, after only three seasons, the company was put into liquidation and Soay was put into receivership. Maxwell, 34 years old, and not the first incomer to be beaten into submission by the Hebrides, retreated south. The following year he was offered the use of a house at Sandaig, near Glenelg, by Kyle of Lochalsh. Ten years later he wrote a book about that place and the otters he kept there. The book made him famous and, for a time, very rich. With this wealth Maxwell tried to own again Soay, but failed. He tried to buy Sandaig too, and failed. He bought the lighthouse keepers’ cottages on Kyleakin Lighthouse Island—Eilean Bàn as it is known today—and moved there in July 1968. He was already dying of too many cigarettes by then, though he didn’t know it. We rise, decline, perhaps rise again, fall. And so it goes. As an outlying island, Soay always lacked a regular ferry service and received no public utility services such as electricity, piped water and sewerage. A livelihood was always fragile there, and easier life had elsewhere. The islanders petitioned the government for evacuation and in June 1953 the SS Hebrides called at Soay, loaded the thirty or so souls and their possessions aboard and took them 50 miles south to the larger island of Mull, where they were given crofts and were able to find work. Tex Geddes, Maxwell’s erstwhile harpoon gunner, remained on the Soay with his wife Jan and their son Duncan. Tex, something of a local legend (he once threatened to eat the German laird of the nearby island of Eigg), eventually bought Soay from the receivers and, until his death in 1998, wrested a living from fishing, and breeding Highland ponies. He wrote a book, Hebridean Sharker, about his time with Maxwell. He drank hard, told stories and warned off ‘trespassers’ to his island with infamous, ferocious rudeness. Or so some say. Soay, today, is like many of the smaller isles of the Hebrides. Where families once lived, laughed and grumbled, where children played; where there were once schools, working crofts, whisky and stories and envy and lust, there is now a handful of holiday homes and a smattering of part-time summer residents. As for the basking shark, the second largest fish on earth is currently classed by the International Union for Conservation of Nature—they compile the Red List of Threatened Species—as ‘Vulnerable-Endangered’. Sandy and I pick our way back to the cove. The tide is rising and the sea has begun to lap at the kayaks, lifting and dropping them gently with every ripple it sends to bounce off the rocks. We climb into the kayaks and paddle past the now quiescent Dutch yacht, pass over the sand bar, and press on back towards Skye as coalescing clouds spill over the high hills like foam. Then we load up the van under spotting rain and drive away heading for home, whatever that is and wherever it turns out to be. Dan Boothby has written a book about Eilean Bàn, called Island of Dreams: Stalking Gavin Maxwell’s Ghost. His article Gavin Maxwell's Island previously appeared on The Island Review. He has also written and edited books on living, working and travelling abroad.